I have always said that the world of dance is chock full of amazing alpha women… and Phoenix, a Denver, Colorado based belly dancer who teaches workshops and performs nationally, is probably one of the most dynamic chicks I know! A virtual power house, she’s not only an incredible performer and instructor- she’s a dance mamma to legions of dancers in her hometown and directs a couple of troupes- she’s also an event producer , a full-time nurse, a terrific cook, and a doting kitty mamma. 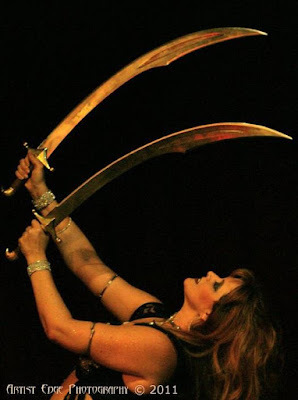 I met Phoenix years ago at the Tribal Dreams belly dance event in Nebraska, and was blown away by her powerful and artistic performance ( her non-stop spins and work with Isis Wings were both off the hook!) as well as her sweet, fun loving off-stage personality. It was there that I discovered that she the co-sponsor along with partner Selayma Anan, of the long-running annual “Shimmy 2B Free”, a large-scale belly dance event and theater show in Denver. The proceeds going to various foundations assisting with health, financial and socio-economic issues, and the show and workshops are super well-organized. I’ve had the pleasure of teaching and performing there twice, and the event, in addition to raising funds for worthy causes, always runs like clockwork. Phoenix’s unique belly dance style is a pastiche of Egyptian and Turkish cabaret, spiritual dance, khaligi, and tribal, and she’s also into various types of fusion, with performances ranging from progressive and transcendent theatrical and dark Goth pieces to light-hearted comedy acts. She’s a master at Isis Wings, often using custom wings two at a time. In 2008 she released her internationally acclaimed instructional DVD “Isis Wings With Phoenix”. She's also the creator and publisher of "Dancing From Within", an innovative deck of belly dance class cards. This deck , based on her holistic knowledge and teaching methods, focuses on physical and emotional development using the chakras, elements, movement and technique, and is a great tool for students, teachers or troupes. Phoenix is always s always preternaturally calm at shows, whether she’s organizing , performing or both… maybe it’s the nurse thing- she’s used to dealing with critical situations on an every day basis! “For me prepping for a great show involves organization and focus. I am an improvisation dancer most of the time but this still involves some preparation regardless if the music is picked in advance or it is a live band. Organizing myself prior to a show may be the morning of - or day before if I can swing it. I consider my audience, music and venue. If I’m not dancing to live music, then I do like to have my picked prior to that week and listen to it. This helps 'set the stage' for what I am planning to present. Knowing that setting helps me decide on what am I planning to present. What I mean by that is - is it emotional, fun, flirty, dark or what is the energy or story? Knowing this helps me easily pick my costume and make up. Once I have these items planned out then the performance often flows with ease. Practicing for the show means listening and dancing to the piece of music or the band. When I do choreograph a piece, I am working on remembering it but ensuring the choreography is not forced and feels natural. For most of my performances, I practice dancing to the music to get a feel for the changes and accents. Knowing the music for an improvisation piece allows me to relax and interact with my audience. The day of the show, I like to have a little down time. It might be relaxing with my cats or taking time with the troupe. I try to not pack my day if at all possible. Sometimes, that’s not avoidable so in those cases I do try to have some quiet time while I put on my makeup. The day of the show, I only allow myself to run a routine one or two times if at all. Practicing too much the day of the show actually stresses me out. I often have a much smoother performance if I have a "go with the flow" attitude. 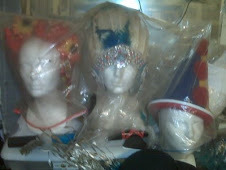 The hour or two before the show, I have my costume, props and cover up ready to pack. I prefer to get ready at home and show up mostly dressed if possible. I try to arrive early as the drive is always the most stressful time for me. I am always concerned about surprise traffic and such. So once I am there then I can take a moment to relax. The moments before my performance, I do a little warm up with shimmies, slides and a few pops. I can use whatever music is there to do this or might listen to mine in an iPod. This ensures my muscles are awake and ready to roll. I do try to have a minute of private focus time by just standing alone and deep breathing to relax my mind and body. I do often get backstage 4 to 5 numbers prior to mine to ensure my costume is in place and ensure I do not distract from other acts. I can often watch from the side stage while doing a quiet warm up and focus. It is hard for me to sit still prior to dancing so I love being earlier in a show rather than later. This way I get to see more of the show also! I feel working together backstage is really important for all. The energy we create impacts each other. I love being a part of shows where people are excited even if they are nervous. If there is a drama or turmoil, I avoid it to ensure that I do not absorb negativity. As any sponsor will tell you, the ritual and plan for shows where you are the sponsor changes drastically. The basic ritual is to ensure all are okay and show is starting then be backstage on time. For these shows, I pick music and props that do not require a ton of prep and often dance to music I have used in the past. 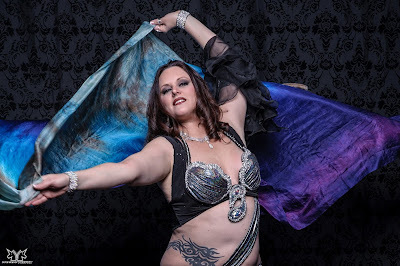 Phoenix is teaching at The Las Vegas Belly Dance Intensive on this coming Sunday, Sept. 13th, 2015 8:30-10:00am. Her “Express Yourself” workshop focuses on connecting emotionally to the music.